The Library has just subscribed to Beckett Digital Library which can be accessed via the Databases A-Z List. It has also been indexed in Database by Subject for English Literature and for French Studies. 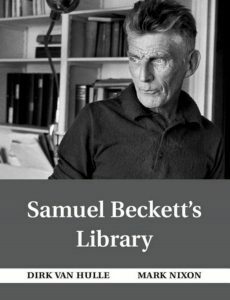 The BDL is a digital reconstruction of Samuel Beckett’s personal library, based on the volumes preserved at his apartment in Paris which currently houses 760 extant volumes and 248 virtual entries. The BDL module, being part of the Beckett Digital Manuscript Project, contains scans of book covers, title pages, all pages with reading traces, flyleaves, colophons, tables of contents, indexes and inserts of various kinds. In addition to facsimiles, it also offers transcriptions of readings traces and links to Beckett’s manuscripts. The module is both browsable and full text searchable. The BDL is accompanied by a monograph (Dirk Van Hulle and Mark Nixon, Samuel Beckett’s Library, Cambridge UP, 2013) which can be found in Discovered. This entry was posted in English Literature, French Studies by stong. Bookmark the permalink.